This week I'm taking a look at two engaging science fiction collections from Image Comics imprints. Both do what strong science fiction should do, which is to use fantastical concepts to pose questions that make us ask about ourselves and how we are living right now. An elite military team has infiltrated a hostile, dying alien world, in order to prevent that aggressive alien species from invading and taking over the military team's home world. The catch is, that dying world is Earth and the aggressive aliens are humans. That's the hook behind the engaging series Horizon, from Image Comics/Skybound. 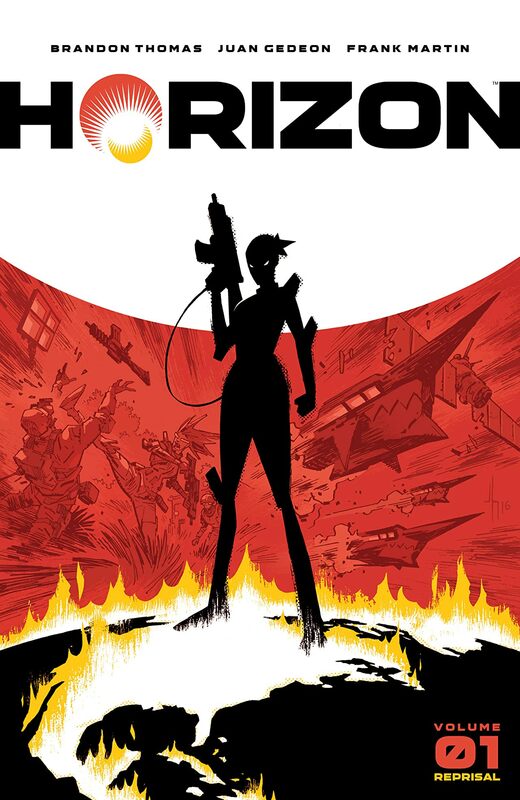 Horizon is written by Brandon Thomas, and illustrated by Juan Gedeon, with colors from Frank Martin. Volume 1 (collecting issues 1-6) is currently available in paperback. Zhia Malen is from the planet Valius which has been targeted by Earth as a future home for humanity (we've wrecked this place and we need somewhere else to go - not a good look for humanity). Malen is a dedicated agent who has been called upon to sacrifice herself (and years of her own life) in order to modify/upgrade her as a soldier who can help infiltrate Earth and prevent humanity from ever being able to leave. She's got help from other agents from the planet Valius who are here working undercover under her command. This first arc of Horizon is really an introductory story; it establishes the team, the threats against them, and their ultimate mission. Horizon was an entertaining, action-packed read. It took me a little while to get into the story, but I feel like that is in fact by design. This is fundamentally a story about aliens on Earth, and while there are humans in the story they are secondary characters. Horizon sees human beings the way we would typically see an alien threat in a typical, human-centric story. So, while humans are present throughout the story, we don't really see their humanity. We see human beings as the visitors from Valius see them - as hostile, as savage, as people that are trying to capture, torture or kill them. So, this is a fundamentally alien story. And, since we're not visitors from another planet (well, I'm not, I don't want to speak for you), what the creative team does here is start the story with a sense of (for lack of a better word) alienation, as we begin the story by seeing Earth from the eyes of a visitor from Valius. The first few pages there isn't much of any dialogue or recognizable language at all. We hear English being spoken the way that an alien might hear it - sounds that approximate the sound of English but without the real meaning. If you don't know a language, it would just sound like gibberish, and the story (with effective lettering from the always excellent Rus Wooton) does an excellent job of portraying that confusion until Zhia Malen is able to get her translator to work. This is a fast-paced, action packed series, and that is brought to life by the rough and kinetic illustration of Juan Gedeon. 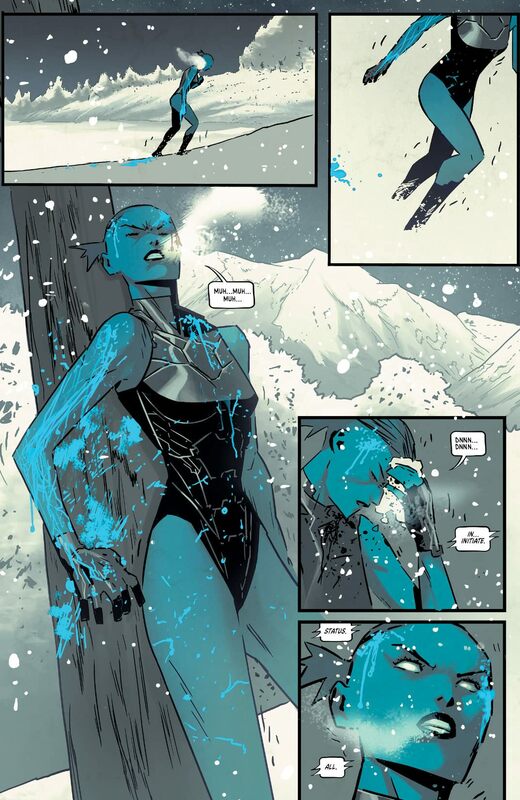 Gedeon does an excellent job portraying the speed and power at which the visitors from Valius can move (particularly Zhia - do not mess with her). He also portrays the way she can move from compassionate to extremely fearsome. Gedeon's linework in this story is loose, spare, straight and sometimes a little jagged where it needs to be. Action sequences are very effectively drawn, as Gedeon has a great sense of motion and the interaction between characters in a combat sequences. Those sequences are often drawn with a very minimal, impressionistic line. It's not hyper-detailed, but it works pretty well as your mind fills in some of the character details. 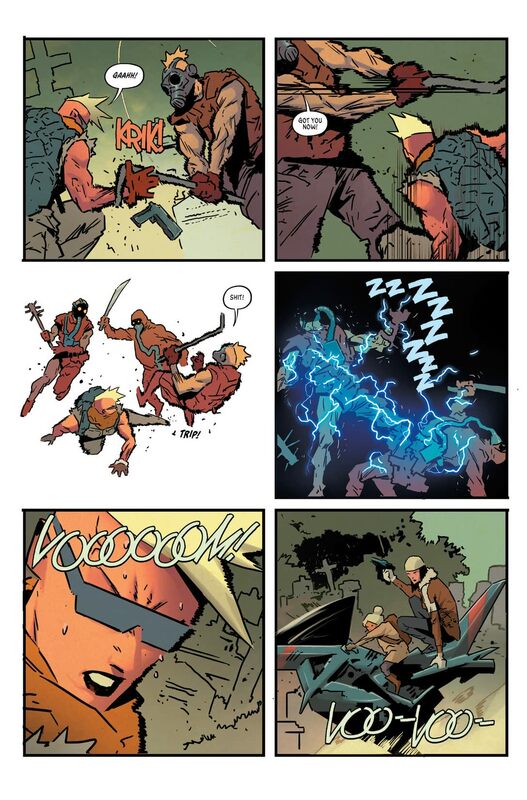 The jagged effect (when one character kicks another, the lines around the person being kicked have sort of a zig-zag effect) is something I haven't seen before, and it's an effective and nonstandard way to convey physical impact. Frank Martin does great, complementary work with Gedeon in coloring this series. As a huge fan of Martin's work in East of West, I was already predisposed to like this book, and Martin delivers distinctive but similarly excellent work in Horizon. From a dramatic underwater sequence (in which the characters are illustrated only in shadow, to the grimy earth tones of the near-future Earth in which the characters live, to the bright colors of the alien visitors, Martin's colors are an integral part of the storytelling. There are a lot of fun, engaging effects in this series, such as the digital zigzag effects that convey sudden motion, colorful, old-school sound effects lettering, lightning and crackle (not exactly Kirby crackle, but similar) to show a character's visual transformation, and pixellation to focus the reader's attention on a particular panel or image. It's engaging, kinetic visual work all around. This is a story that doesn't explain everything that's going on. As the agents from Valius are new to this world, so are we. We see glimpses of the near-future in which this takes place (both through visuals of croded, dirty cities, and audio from news reports), and the creators paint a somewhat bleak picture. This isn't a dramatically apocalyptic world, more like we're slouching towards oblivion. There are also parts of the Valius alien society and structure that aren't yet explained, but the alien invaders are given a lot of space that you can really begin to see who they are as people. A story can be accessible without telling you everything, and Horizon strikes that balance well. It took me a little while to get used to the storytelling style in this book but I'm really interested to read more. If you're looking for thoughtful and action-packed sci-fi with a strong hook, Horizon is a great place to start. Sure, life is pretty rough these days. There's a lot of uncertainty. But...at least the sun won't burn you to a crisp within seconds of being outside. How would we adapt to life living underground, when instead of being something that nourishes us, the sun becomes our greatest enemy? That's the premise behind Eclipse, written by Zack Kaplan (no relation) and illustrated by Giovanni Timpano, with colors from Chris Northrop. It's a great premise, but what makes Eclipse a compelling story is not just the premise, but the murder mystery and personal drama that unfolds in this new, catastrophic world. Volume 1 (collecting issues 1-6) is currently available in paperback. Ten years before there was a horrific solar flare event, which killed billions of people and forced the remainder of humanity underground. It's a nocturnal society now, as folks can only go above ground during the nighttime. Bax is a maintenance worker in this new, changed version of society. He's regarded as a hero for his actions on the day of the flare (he was a firefighter who saved the Mayor), and he's an expert now on the suits that anyone must wear in order to survive being above ground during the day time. This expertise, and Bax's knowledge become crucial when there's a series of murders that take place above ground, which themselves lead to bigger and stranger mysteries. I really enjoyed this first volume. Kaplan has a great idea in this story; seeing humanity adapt to changed circumstances often makes for excellent storytelling, and this is an interesting hook and way to explore humanity's adaptability to a problem that wasn't necessarily the one we were expecting would doom humanity. In some ways, the idea that the surface of the Earth becomes uninhabitable because of a solar flare lets humanity off the hook for its own damage to the environment. However, what the setting does do is give Kaplan and his co-creators a chance to explore a world in the near future where people have to adapt very quickly to a very changed situation. What would having to live underground during the daytime do to our psychology? What would the radical change in sleep patterns do to human functioning? While this story isn't primarily about those things, the interesting questions that are raised in Eclipse make for fascinating background in which to have the main story take place. The character of Bax is an interesting window into this story. He's a reluctant hero, but an interesting one, and his skepticism helps ground the storytelling. Kaplan has strong storytelling partners in Timpano and Northrop. Timpano brings a realistic, gritty, and strong line to the proceedings. 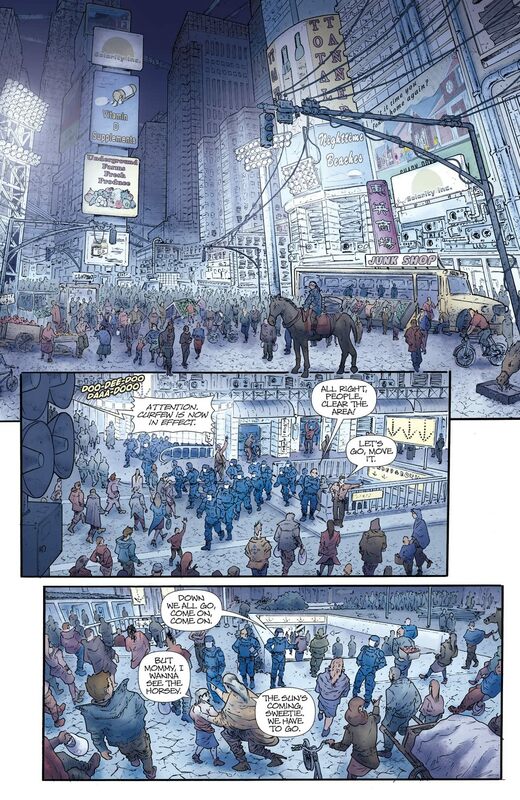 Such as in the below panel, Timpano pulls off a nice trick in showing a weird and different Times Square that's absolutely recognizable and realistic, but done in an "analog" way that doesn't feel like photo-reference. Both in the above ground scenes in New York, and in the scenes underground, Timpano provides a lot of background detail, and a weathered quality, that gives Eclipse an authentic sense of place. This really does feel like what New York City might look like ten years after a natural disaster, and the new, makeshift, underground world has a lived-in quality that really sells it as a realistic future. Timpano does a lot of good, precise character work throughout the story. Bax is a believably gruff, damaged hero, and he and all of the other characters are nicely portrayed with some precise work around facial acting and body expressions. The emotional work is strong in this book, and the sense of detail that was applied to the backgrounds is also extended to the specific choices in character design and clothing. I can't say enough good things about the great work Northrop does in coloring this book. 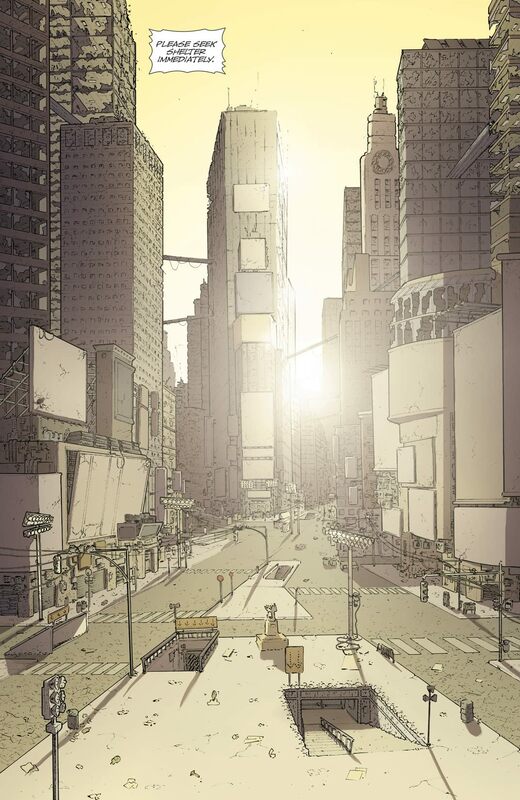 As shown in the above page and throughout the series, Northrop gives the sun a quality I've never really seen in a comic before. The sun is a killer now, something terrifying, to be avoided at all costs, and Northrop does great work in showing the oppressive nature of sunlight throughout this story, including in scenes where the sun is used as a weapon. In the scenes of nighttime and underground, Northrop does similarly precise and effective work; the fluorescent light that pervades their world gives everything a little too much unnatural light. Northrop extends this great color detail generally throughout the series. Troy Peteri also extends the "post-fall of society" feel to the hand-drawn style lettering that's quite effective in this series. This is an interesting, fun, accessible read. 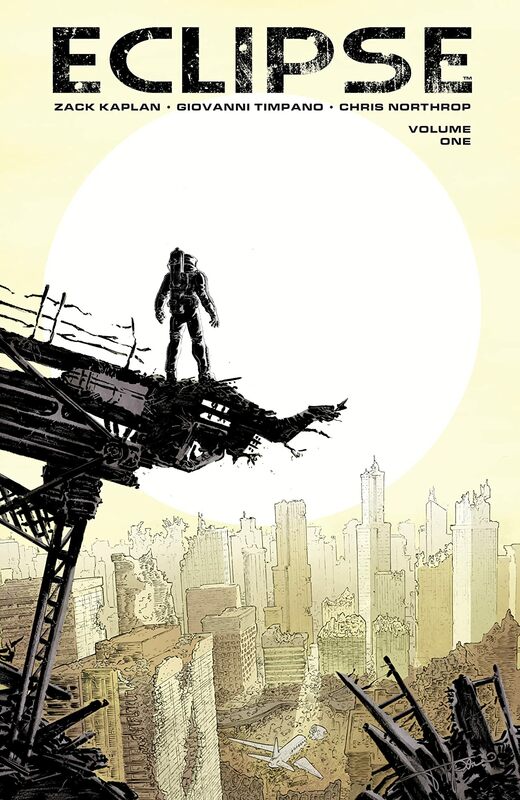 If you're looking for an enjoyable sci-fi comic, I definitely recommend Eclipse.